We operate whale watching trips year-round. 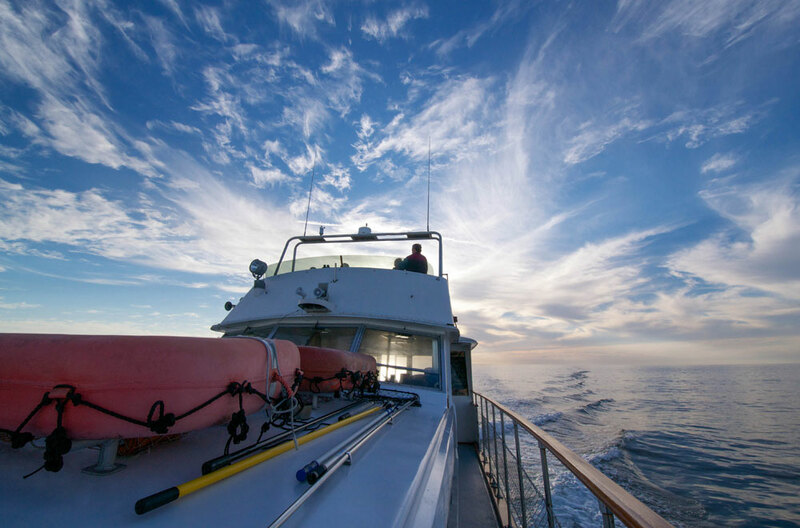 We’re a small, owner-operated business with one boat dedicated to whale watching and private charters. Prices, tour start times and durations vary throughout the year so please check our trip dates and times. Please arrive 20 minutes before departure for check-in and safety instructions. Trips depart on time and usually arrive on time (we’ll often stay out a bit later than scheduled if we encounter something particularly spectacular and need more time to check it out). Dress for snow! You can always remove layers during the tour if it’s too warm. It’s usually about 10 degrees cooler on the water than land. Food! We have a small snack bar on board but you’re welcome to bring your own as well. Pregnant women and children three years and under are not permitted for safety reasons. Not suitable for those with chronic neck or back problems or elderly people with limited mobility. Our vessel is not wheelchair accessible and steps are used for boarding. If you need special accommodation, please call 831-600-5103 to inquire. If you are prone to seasickness there’s a good chance you’ll get seasick unless you do something to prevent it! If you’re not sure, it’s better safe than sorry! Doctors prescribe motion sickness patches (we’ve found those work the best) or you can get motion sickness pills over the counter. Once tickets are purchased, there are no refunds. Sea conditions can be unpredictable and weather reports are not always accurate. Trips are subject to cancellation if the captain determines sea conditions to be unsafe for passengers. If a trip is cancelled due to weather, a full refund is issued or you can reschedule for another trip. It is advised to provide reliable contact information in your reservation so we may call you in advance if a trip is cancelled. If you have any other questions about our trips please check out our FAQ section. HOW ABOUT BOOKING A BLUE OCEAN CUSTOMER CHARTER? Check out our independent real reviews on Trip Advisor, Google places & Yelp. Our Trip Advisor rating is 5 out of 5! We also have loads of testimonials from clients who have been on the Monterey whale watching trips.